Archbishop Thomas Edward Gullickson, Apostolic Nuncio in Ukraine, handed over the Patriarchal Cathedral, held in Ivano-Frankivsk on 25-27August, titled "Living Parish - a meeting place with the living Christ", greeting and blessing from the Holy Father Pope Francis. Greetings of Apostolic Nuncio was read by Father Petro Zhuk, rector of Kyiv Trisagion Theological Seminary. "As the papal representative of Ukraine, I have the honor and joy to express on behalf of His Holiness Pope Francis best wishes for full success of the discussions, assuring a blessing of the Holy Father for this meeting", - wrote the Apostolic Nuncio. Archbishop Thomas thanked for the invitation, but He, unfortunately, has not come. 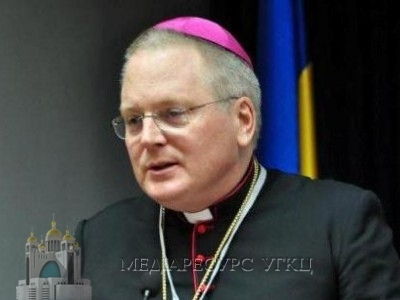 "After I read with great interest the program on 25-27 August , I decided not to come to the Council to Ivano-Frankivsk, as I did not want to make additional worries to the organizational committee of the Council" - jokingly said the Apostolic Nuncio. "I wish your conjoint reflections on this subject brought generous fruit. With all the blessings of heaven may always and everywhere be the glory of Jesus Christ"-wished the Representative of the Pope Francis.